I've never eaten chili crab at home before and I've certainly never eaten chili crab alone. Tonight, I pulled out an entire chili crab left over from my Red House dinner tasting last night. It felt strange at first--almost pitiful. Here I was on a Friday night of Formula1 weekend with plans having fallen through, eating left over chili crab by myself. 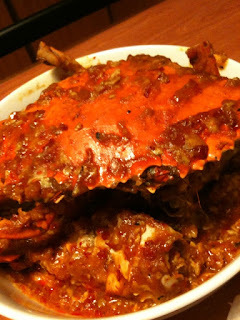 My plentiful chili crab experiences beforehand always meant company with good friends and family, so crabs seemed like something that always ought to be shared. But I went ahead, warmed it up and set it on the table. Eating chili crab at home by myself ended up being the best experience I've had all week. It was the silence of my kitchen, the unabashed use of all ten fingers, and taking the last claw absolutely guilt free... It had a remarkably calming effect. It has been the only time in a while that I've truly had time to myself, away from people, phones and the computer. And I was glad I could share it alone with this crab. Oh yes... he feels warm and cozy in my belly as I type this. nom. Greedy bum....why dont you share? !